“Panta” (detail) © Swiss Foundation for Alpine Research, 1965, 1:25,000. 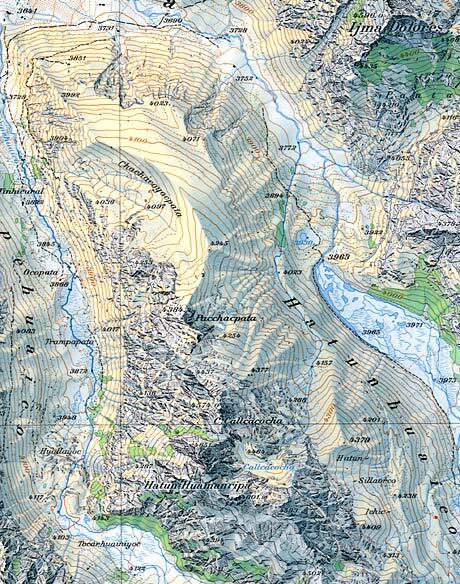 In 1965, the Swiss Foundation for Alpine Research published the map “Panta”, part of the Cordillera Vilcabamba in Peru. 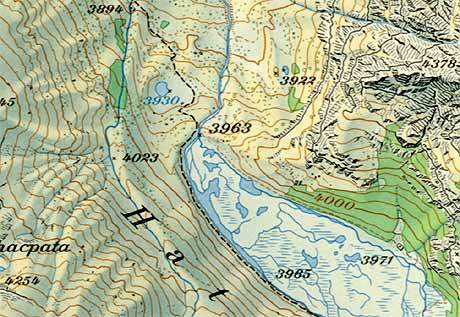 The map resulted from an expedition by the Swiss Alpine Club in 1959. Ernst Spiess, topography engineer at the Federal Office of Topography (swisstopo), produced the map. He was responsible for the photogrammetric field and restitution work and for editing, planimetric and rock scribing, swisstopo cared for relief shading and printing. “Panta” (section) © Swiss Foundation for Alpine Research, 1965, 1:25,000. “Zur Karte der Panta-Gruppe” by Eduard Imhof. “Als Topograph in der Cordillera Vilcabamba” by Ernst Spiess, Berge der Welt, Band 15, 1964/65, p.135-156. Schweizerische Stiftung für Alpine Forschungen. (pdf, German).